Perhaps not the best article for a blog about buying real estate in NYC. 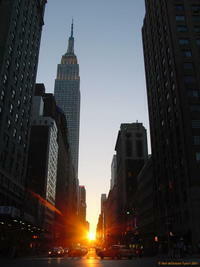 The topic; what will future civilizations think of the grid arrangement of Manhattans streets? Neil deGrasse Tyson thinks they may conclude we worshiped baseball and war. Two things that stand out to me and have always been part of the conversation when I speak with clients, " Each building is an Island,price correctly and let the market work". Sales spiels from Glenngary Glenn Ross don't have a place in todays high tech, transparent marketplace. Honesty, knowledge and transparency have taken the place of the classic, old school sales pitch. The NYC buyer is highly educated and wants an informed broker partnering with him/her to assist with a sound strategy and assessment of valuation. Seeing what is right with the deal is easy, we work hard to identify what is wrong with the property/deal. Perhaps it is a bit naive to say we don't ever sell, however we certainly resist the urge and seek to provide clear insight and information to assist the client with drawing sound conclusions. "Our index current stands at 143.31. It pins the peak of the market back in June 2015, with a value of 154.89. So, the UD index currently thinks today’s Manhattan market is -7.4% from the peak hit in mid 2015." As I have become more successful my focus has been on how can I give back? I certainly have worked hard to get where we are and that makes the drive to give back in some meaningful way even stronger (besides rebates! lol). What is difficult, in a world where there is so much need is where, to whom? The goal is to give a fixed % of each deal to a charity, my heart says 'children'. If you have any suggestions, please share them. More Great Feedback from our Clients! 6 Deals Closed in the Last 10 Days! We have continued to grow with zero paid advertising and it is because of the great testimonials we get from the wonderful clients we work for. Thank you so much for working with us every steps. You guys seems too good to be true but it was really true! Keith, we deeply admire and agree on your work philosophy in this field and hope you be the successful pioneer and path finder( as you already are!). You've been always very solid, candid, reliable and experienced. Christian, you don't say much but your every word has a keen and valid point. Your advice really helped us to decide many things on sight. Through the process, we've felt safe because we could see you stand with us, not with the opposite side. Lance, we didn't have a chance to meet you this time but i am sure you are great and hope to meet you next time. I wish you inspire other competitors and change the market. Also I wish you grow not only your buying but also selling part so we could get help from you again when we sell ours. Thank you so much! It was great pleasure to work with you and wish you the best!